Alongside iPad 2, Apple has released a new $39 "Digital AV Adapter" that supports HDMI audio and video output for 720p photo slideshows and movies on iPhone 4, iPod touch 4 and iPad, while also supporting video mirroring on the upcoming iPad 2. 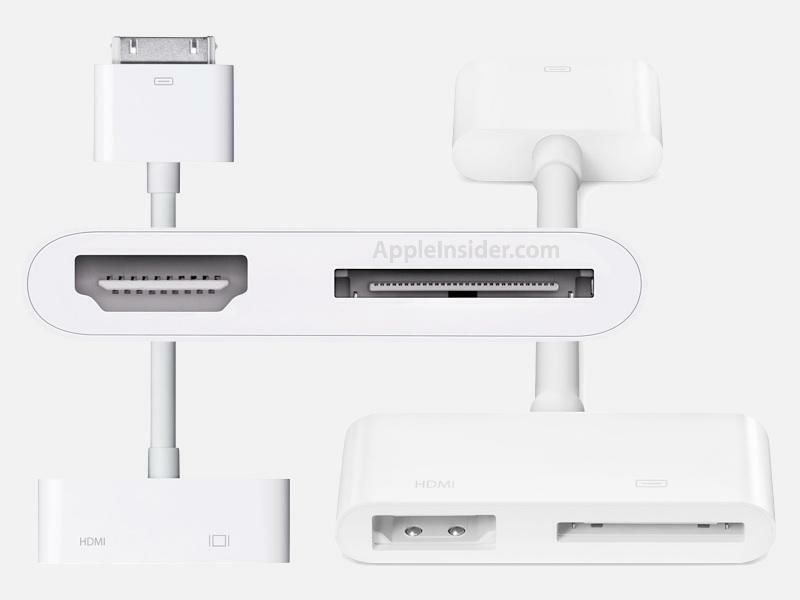 The new adapter plugs into the Dock connector, providing both an HDMI port and a Dock passthrough so attached iOS devices can charge while playing or sync while connected to an external display. "Watch slideshows and movies on the big screen in up to 720p by connecting your iPad, iPhone 4, or iPod touch (4th generation) to an HDTV or HDMI-compatible display," Apple notes on its store page. "Use the Apple Digital AV Adapter to mirror whatevers on your iPad 2 screen  apps, presentations, websites, and more  on your HDTV or HDMI-compatible display in up to 1080p HD (movies play at up to 720p)." Previously, the iOS devices introduced in 2010 only supported VGA output, which provides analog component video with no support for audio out. It was not known that iPhone 4 and its iPod touch sibling also had latent support for HDMI, a digital connection that pairs DVI video signals with audio. Most modern HDTVs support HDMI input. Apple also supports AirPlay wireless audio and video streaming from iPhone 4, iPod touch and iPad, which uses WiFi to deliver music photos and video to the new iOS-based Apple TV, or audio to AirPort Express base stations and some third party devices that support AirPlay.